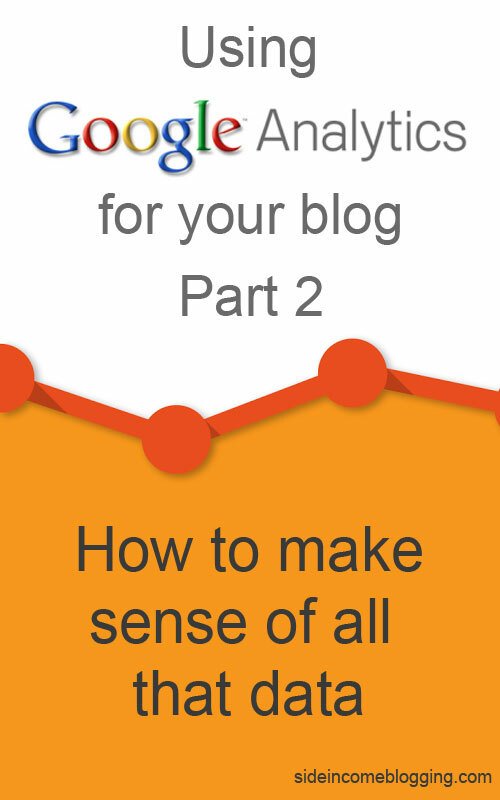 This is part 2 of a series I’m writing called Using Google Analytics for your blog. 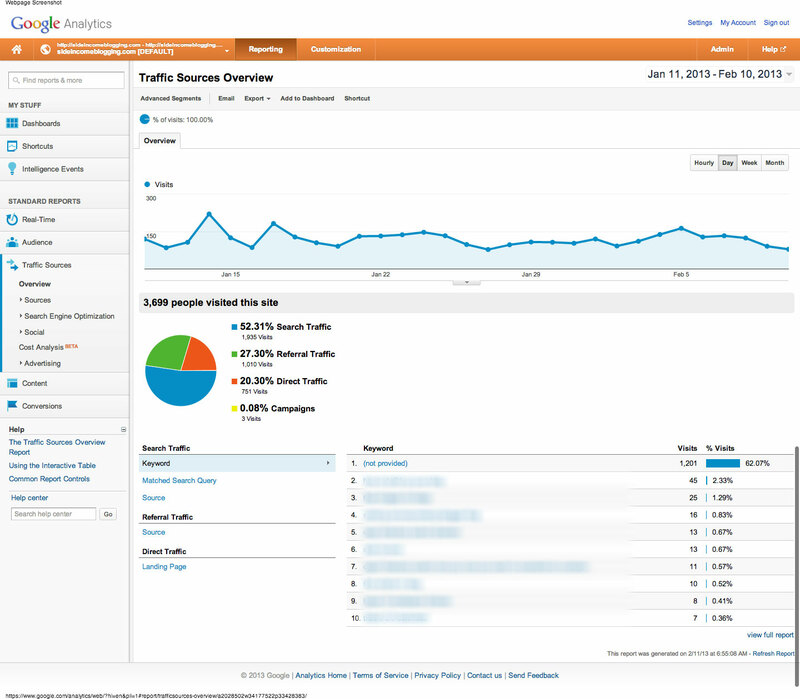 If you missed the first part, which discussed what Google Analytics is and went over the Google Analytics Audience Overview section, please head over and give it a read. This article will dive into the next section, Google Analytics – Traffic Sources where we’re learn how to find out who is sending you traffic. Remember, this series will touch on the basic information from each section of Google Analytics. The article is not intended as a deep dive into all of the underlying detail that Analytics provides. As I stated in first part of this series, doing a full deep dive would take a large eBook. This article and the others in the series will focus more on basic information you’ll use on a frequent basis. Day to day, visitors arrive on your website. Some of them go straight to your blog using your URL or domain name. Most of them more likely come from other sites such as Google, Bing, Yahoo, social media, and blogs that link to you. The Traffic Sources overview page will show you where these visitors come from. Let’s look at the data provided on the main screen first, then we’ll dive into some of the other sections that you’ll find useful. The graph at the top of the page is the same as the graph in the Audience Overview. By default it shows your Visits. You can also adjust the graph to view other information. I seldom ever change this. You can also adjust the date range in the upper right corner. By default the last 30 days are shown. Below the graph is a summary of how many people visited your site along with a pie chart showing the breakdown of traffic sources by search traffic, referral traffic, direct traffic and campaigns. Search Traffic – Shows the percentage of your traffic that arrived from search engines. Just below the percentage is the actual count. From my screenshot, my search traffic accounted for about 52% of my overall traffic. There really isn’t any “good” or “bad” number here. Good and bad are relevant based on how you are targeting your traffic. Generally though, you want this number to be fairly high, and greater than 50%. Why? Search engine visitors are the visitors that generally click on ads. If you’re trying to earn income, especially using Adsense, search engine visitors are the primary type of traffic you want. Referral Traffic – This is traffic coming from other sites outside of search engines. This traffic is the result of people clicking on links and arriving at your site. I’ll show you how to figure out exactly which sites below. This would also be where your email list traffic would be included. Direct Traffic – This traffic comes from people directly navigating to your website, either from a bookmark in their browser or by typing your blog’s URL directly into their browser. To the right of the summary data is a list of keywords that people used in search engines to arrive at your site. If you’re like me, a large percentage will fall up under “not provided”. You can read about why your keywords are hidden in David Kutcher’s article A “not proivided’ tip from your analytics. In the screenshot, I hid my keywords – I apologize for that. Unfortunately this is the internet, and you can’t trust everyone. I know most of you are honest and straight up, but I’ve just worked too hard to rank well for some of these, and don’t want to risk someone trying to out rank me. Hope you understand. The summary information is good of course, but there really isn’t a whole you can do with it. The good stuff is down in the details a bit. Under the Traffic Sources menu is another menu named Sources. Click to open it, and then click on All Traffic. All Traffic will show you, in order of Visits, who your top traffic sources were from for the time period selected. I use this frequently to see if any large sites have linked to me, to see how many click throughs I’m getting from guest posts I’ve done, and also to see which social media platforms are doing well for me, and which ones are not. This is one of the Google Analytics screens I check at least once daily. The Pages/Visit metric I discussed in the first article in this series was for your whole site. On this page though, we’re seeing these numbers broken out by referrer. This allows you to see how “sticky” traffic is from each of the referrers listed. For example, looking at mine, I see the pages/view for Google+ and other blogs that refer to me have higher numbers, where searches from Google have lower numbers. Google users are typically looking for an answer, they get it and move on. Where links from guest post articles often involve people browsing my site and spending more time. If you’ll note, the bounce rates reflect the same. Also interesting is Pinterest. I received a really nice burst of traffic from PInterest, primary from my How to Build up Your Blog article, but the bounce rate is high. I’m going to give myself a little homework assignment to research if that’s common, and if not look at some additional changes I can make to make Pinterest visitors a little more sticky. I’ve already taken one shot at this, but obviously need to improve a little more. The direct sub-menu will show you the pages people visited directly. Generally this is because people have bookmarked your content. These articles are typically “evergreen” content articles, and frequently some of your “best stuff”. Which is why people bookmarked it. For earning money, these are articles that you would typically want to tweak to either include ads or affiliate offers where applicable. I don’t typically use the Search page or Referrals page much as the information I need is on the overview page. This page will provide you with more detailed information about the queries users are putting into Google. Clicking on the Queries menu will show you a list of keyword queries people are using to arrive at your site. While this is interesting information, I personally seldom use it. I prefer to use Google’s Webmaster tools as they provide you with much better and more comprehensive information. The Landing Pages menu shows you the pages from your site that visitors arrive on most frequently when coming from search engines. I use this page to determine which of my blog posts I need to focus on making “sticky”. The strategy here is to use this data to determine which pages visitors land on, then update and edit those pages so that visitors have lots of more content options to click on. You can give them more options by editing your article text to include additional links, adding “Other pages you might like” options and adding widgets to the sidebar to feature more content. The Geographical Summary menu will show you what countries your search traffic is coming from. Good information, but again not something I’ve found a need for just yet. The graph is really more focused on conversions – meaning social traffic that lead to people making purchases or clicking ads on your site. 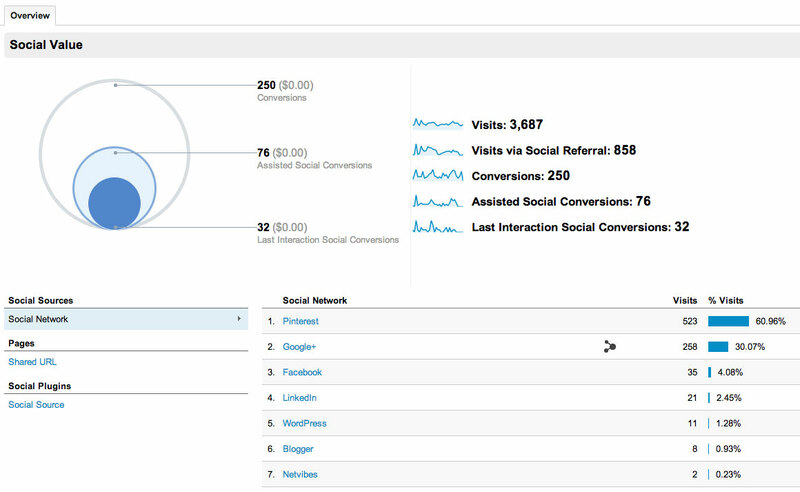 Conversations are calculated using Google Analytics goals. I won’t go into the details of goals, but at a high level goals allow you to keep track of when people visit certain pages on your site. I have goals set-up, which is why I’m showing some conversations, but not dollar amounts. The main data that you’ll be interested in on this page is in the lower right hand side. This will show you the number of visits you received from social media, and the percentage of overall site visits that social media accounted for. As you can see here on Side Income Blogging, over the past 30 days, Pinterest was first, Google+ second, and Facebook a far third. Similar to earlier pages we looked at, this page shows you more detail about your social media visits. The graph shows you a comparison of your social media traffic to your overall traffic. The table below shows you detail on Visits, Pageviews, how long the visitor was on your site and how many pages they viewed per visit. This is actually a pretty interesting section as it gives you some good data on how sticky your social media traffic is by social media site. You can use this data to determine where and how to spend your social media efforts. The Landing Pages section shows you what pages visitors from social media arrived on, again with information on pages/visit and duration. You can use this page to determine which of your pages was most popular on social media. Knowing which pages did well, allows you to create similar or complementary content that should also do well on social media. I mentioned conversions above, and primarily this section is intended to capture monetary earnings from conversions resulting from social media traffic. I personally don’t use this section currently. This page is used to track specific actions that occur and are specific to social media. For example, on Google+ it would be +1s, on Facebook Likes, etc. 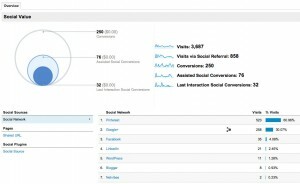 By default, Google Analytics will track your Google+ activity automatically. For other social media sites, you’ll have to make some changes to your default Analytics scripts. I personally don’t track this level of data but if you’re interested, you can read up on how to add additional social media plugins on the analytics help page. This is another page I personally don’t use much, but definitely has a high cool factor 🙂 On this page, you can see, by social media site, the path that your visitors navigate through on your site. The flow graph even shows how many people went from page to page so you can see how many dropped off your site, and how many didn’t. Like I said, really cool, but not something I’ve found highly useful just yet. 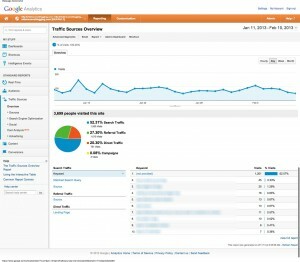 That wraps up the Traffic Sources section of Google Analytics. As you’re probably beginning to see, Google Analytics tracks an enormous amount of data and most of it you probably won’t use frequently, at least if you’re like me. Next in the series we’ll discuss the Content section, then I’ll wrap up this series with some very specific tips and strategies for how to pull out some valuable information about your site from Google Analytics. Analytics is a really powerful tool for improving your site, and I hope you’re finding this overview information helpful! I don’t have Analytics YET, but I skimmed and wanted to thank you in advance for doing these write-ups. I have them saved and I know where to go when I need help! You’re welcome Shawn – They are big articles, but my intent was too provide good reference material when it’s needed. The search in the top righthand corner should hopefully help as well. Thanks for commenting.